Navigate to the path desired. 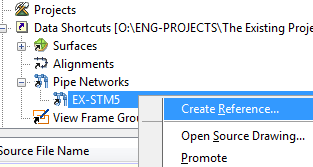 If this is project related, and the short cut is to remain with the project information, then set this to be the same name as the existing project. If this is a Controlled collection, then set the folder to the collection base directory. If this is a one time promotion, then use a temp path on the local machine. Once set, the application will begin to collect the Data Shortcut folders here. Immediately a dialog will appear and allow you to navigate to the Shortcut folder desired. Once again I will show the examples, built upon the previous example paths. Note the Use project template option towards the middle of the dialog. 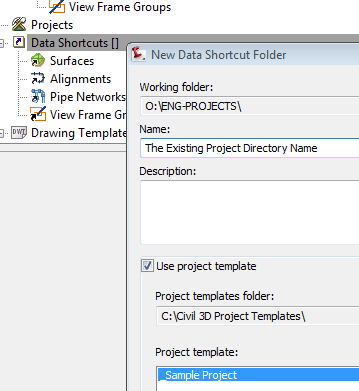 It points to a project template called _Sample Project, located in the C:\Civil 3D Project Templates\ path. If you navigate there, you should be able to see a structured set of directories that will be duplicated into the Data Shortcut Folder, along with the ‘_Shortcuts’ folder that will contain the actual shortcut information. You can create different organization templates, and customize them as you see fit. We already have a project information structure, so this option is not needed. Once completed, the ‘_Shortcuts directory will be placed in the path specified. 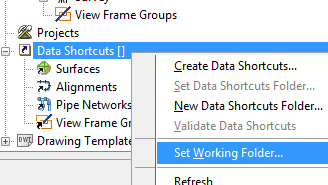 That path will now be available for selection in the Set Data Shortcut Folder Dialog. 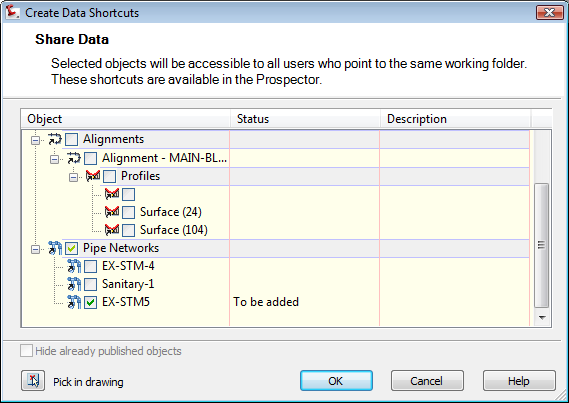 The Create Data Shortcuts dialog appears with a list of Objects that can be referenced from the current drawing. We can now select the objects needed. Others can be added later as needed. The collection Shortcut Folder can contain shortcuts from other drawings as well. Note: The _Shortcuts folder can be copied and moved as needed. Once the copy location Data Shortcut Folder is established in the Data Shortcut Node in the Prospector, the data will be accessible. Once selected, the Create reference dialog appears as shown in the image below. 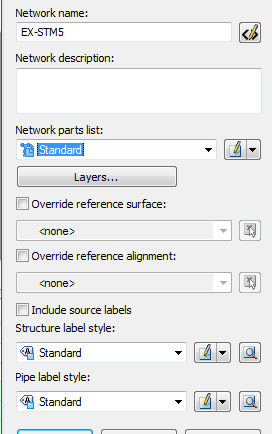 Ensure the correct project Network Parts List is selected, as well as the Various Label Styles desired. The display styles of these references are completely customizable. You should also note the Override Reference surface and alignment, allowing Object referenced tied in the previous drawing, to be retied to others in the recipient drawing.